Today, I am announcing that after much thought, and with mixed feelings, I will be moving on from my role of coaching Team Homan, effective with the 2014-15 season. To be a part of their amazing success has been very satisfying and I want to thank the team for this tremendous opportunity. While it has been a privilege and an honour to have coached Team Homan for the past two seasons, regrettably, the time away from family has been difficult. Regardless, I will always be the team’s No. 1 fan, or at least tied for first place with many others! Rachel, Earle & Lisa at the 2013 Ontario Scotties. While I am announcing a break from full-time coaching in 2014-15, I will not be taking a break from High Performance Curling (HPC), because of my continued fascination with the subject and the interest others are showing in tapping into my knowledge. I will stay involved by helping teams and individuals with their HPC preparation through participation in camps, clinics and conducting research in this area. Next summer (2015), I will re-assess and plot my high-performance curling future. In all probability, I may find my year off from full-time coaching so rewarding on a personal and family level that I will fade into the sunset! At the same time, I definitely feel that I have the energy, desire and capability to continue coaching HPC. Team Homan, I believe, is without a doubt, the best thing that has ever happened to women’s curling. Their future is so incredibly bright and their place in curling history awaits them. I will always have a warm and special place in my heart for all of the team members. Holy Toledo, it has been a blast! "Earle has been with us since the beginning and we are so grateful for all the knowledge & experience he has taught us over the years. He taught us everything we needed to get to the point we are at now in our careers and there are no words to describe how much we appreciate his contribution to our team and to curling. As he steps back from competitive curling we are excited for him to focus on other joys in his life, his wife, grandkids, and family. 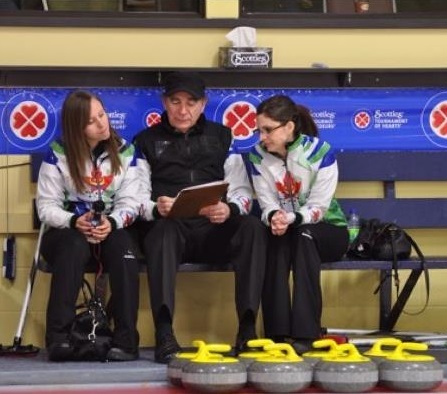 We wish Earle nothing but the best and he will always be a big part of our continued curling careers as we learn from our failures and celebrate our successes. He may not be on the coach bench anymore but we will take with us everything he has taught us along the way. As long as the event coordinators keep karaoke in the patch we will without a doubt continue to see him and his vocals at competitions." Curling’s not my only passion!